How Teachers Integrate Technology and Their Beliefs About Learning: Is There a Connection? Research indicates that teachers who readily integrate technology into their instruction are more likely to possess constructivist teaching styles. Evidence suggests there is a parallel between a teacher's student-centered beliefs about instruction and the nature of the teacher's technology-integrated lessons. This connection between the use of technology and constructivist pedagogy implies constructivist-minded teachers maintain dynamic student-centered classrooms where technology is a powerful learning tool. Unfortunately, much of the research to date has relied on self-reported data from teachers and this type of data too often presents a less than accurate picture. Versus self-reported practices, direct observations that gauge the constructivist manner in which teachers integrate technology are a more precise, albeit protracted, measurement. In this study 32 classroom teachers completed a survey to measure their beliefs about instruction, but they were also directly observed and rated with the Focus on Integrated Technology: Classroom Observation Measurement (FIT:COM). The FIT:COM measures the degree to which technology integrated lessons are aligned with constructivist principles. Analysis did not reveal a significant relationship between practices and beliefs. Although most teachers identified strongly with constructivist convictions they failed to exhibit these ideas in their practices. Judson, E. (2006). How Teachers Integrate Technology and Their Beliefs About Learning: Is There a Connection?. 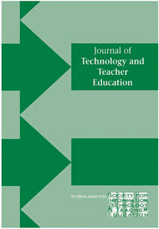 Journal of Technology and Teacher Education, 14 (3), 581-597. Waynesville, NC USA: Society for Information Technology & Teacher Education. Retrieved April 22, 2019 from https://www.learntechlib.org/primary/p/6046/. American Association for the Advancement of Science (AAAS). (1993). American Association for the Advancement of Science: Benchmarks for science literacy: Project 2061. New York: Oxford University Press. BellSouth Foundation (2003). The growing technology gap between schools and students. Report from the BellSouth Foundation Power to Teach Program. International Society for Technology in Education (ISTE). (2000). National educational technology standards for students: Connecting curriculum and technology. Eugene, OR: International Society for Technology in Education (ISTE). Moursund, D. (1999). Will new teachers be prepared to teach in a digital age: A national survey on information technology in teacher education. Santa Mon ica , CA: M i lken Exchange on Education Technology. U.S. Department of Education. (2000). Progress report on educational technology (state by state profiles). Washington, DC: Office of Educational Technology.